Raw power or being light on your feet? It’s an age old debate we hope to settle with a test involving an RS250, GSX-R600, ZX-7R, R1 and RSV-R.
Get chatting to racers and you’ll hear expressions like: " A well-ridden 600 will beat a bigger bike round here any time. " To back-up the claim, they’ll point you to the latest race results at that track. Invariably, they have a point. Take the recent British Superbike round at Brands Hatch, for example. The fastest lap for a 1000cc bike was 46.29s, set by Steve Hislop’s Ducati 996. The fastest 750 was only a fraction slower, with James Haydon’s R7 clocking 46.67. In the supersport race, the best 600 lap was 48.22 – well inside the superbike tail-enders – while the 250s were just behind with 48.34s. But how does that translate to stock, or near-standard road bikes, and riders who don’t hone their skills to perfection by racing every weekend of the year? Does size really matter, or is what you do with what you’ve got that counts? 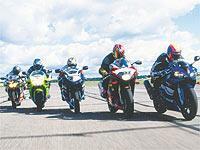 We took five very different bikes and five riders to the Bruntingthorpe track in Leicestershire to find out. The riders were all of a high but varied standard – and for good reason. We wanted to see how the kind of rider you are affects how well you get on with a certain machine. Here we’ll list the bikes involved and then we want you to guess what the outcome was. Make a posting in Talk News (follow the link, right) and we’ll bring you the answer early next week. THE BIKES Aprilia RS250, Suzuki GSX-R600, Kawasaki ZX-7R, Yamaha R1 and Aprilia RSV-R. All demand a different riding approach and all have different strengths and weaknesses. Which will come out on top? Does size matter: the answer. When it comes to the age-old pub debate of whose bike is fastest, there are two trains of thought.